The famous image, His Master‘s Voice, of a dog listening to a gramophone has long been synonymous with the way people listen to and enjoy music. In the 21st century of digital downloads, cloud technologies, and portable devices, Nipper would would wear headphones connected to a mobile phone. 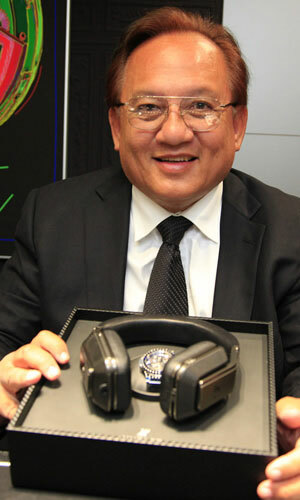 I managed to meet up with Noel Lee, Founder and Head of Monster Cable Inc, at IFA in Berlin for a chat on headphones. For those of you who do not know Mr. Lee, he is to sound and audio what Steven Jobs was to computers. He is an audiophile, a tech geek engineer, and musician. He is charming and articulate. Like all entrepreneurs, the charming and articulate Mr. Lee had a passionate vision to make a better product for a better user experience as well as innovate audio quality. With Monster Cable, he created a new industry standard that could deliver better sound quality while offering more flexible than normal cables on the market. This new technology was quickly adapted by music professionals as well as by other industries for use in video and cars. Mr. Lee is also responsible for The Headphone Revolution. As the engineer behind Beats Headphones by Dr. Dre, he reinvented the headphone by not only designing listening gear as a fashion accessory in the modern digital world but also by evolve the listening sound quality a new level. With these enhancements, professional sound quality has bec ome accessible to all. Monster put Bass into headphones, which added another dimension to the nuanced listening experience. Pure Monster Sound is the latest technical step for the company: high definition audio with sharp clarity and bass in headphones. After having used these headphones, I am convinced of their amazing, surperb quality. What inspired you to start Monster? It was all about the music! I played drums in a band in Hawaii. I was a bit of a tech geek and a musician. What was the Headphone Revolution? We asked retailers to take a chance on $300.00 headphones. Headphones became aspirational items, entertainment electronics and great performance devices. We partnered with cultural influencers who knew we had a great product. They got the word out. We also had brand ambassadors like Swizz Beatz and Xzibit. Why have headphones become a style accessory? They are a statement about you … like sneakers! Sneakers are personal. Headphones are the same. People wanted head phones that looked good. We have styles for ladies, active lifestyle, and high end. How do you differiente Monster from other brands? Engineering and design.We paid close attention to the details. All the technology is in one place for the listener. It is combination of all those elements. Plus, the Pure Monster Sound Headphones are microphones in reverse. Pure Monster Sound is about being immersed in great sound no matter what style of music are listening while wearing Monster headphones. The listener will be as close to the music as being on stage or in the studio with the musician. You hear what the microphone hears–it is that crisp. When you hear the music better you become more emotional. How has streaming and downloading affecting your business? Now, there is availabilty of music on many platforms like Spotify. Streaming allows music to happen. What are the future plans for Monster Inc? A Battery Charger the size of a credit card … pure Monster sound … a new power cord. What was the first record you bought in the store? Old Motown Stuff like Stevie Wonder. I loved Gladys Knight.